Every one needs silly things to wear on your head, so to my kampfrau outfit I wanted a wulsthaube. 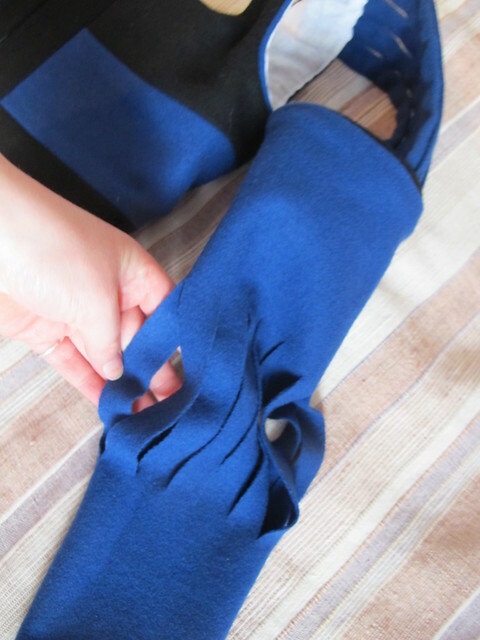 It was super simple to do, I used these instructions but the triangular part I cut on the bias and sewed on a band that was on straight grain. 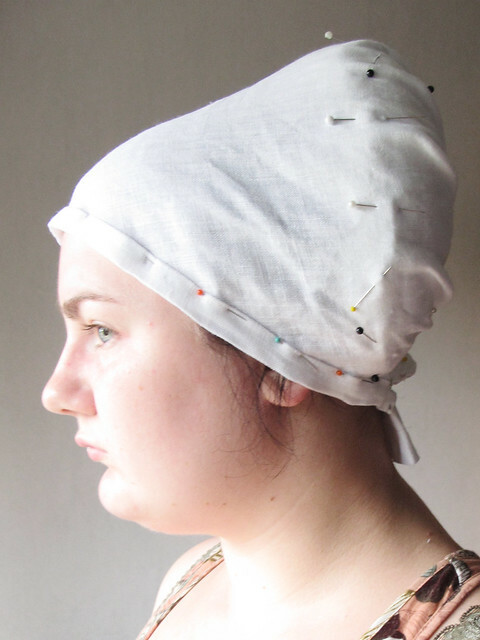 That way it would drape over my bump nicely whilst still having it fit snugly around my head. If I would not have then band the area around my face would stretch over time and it would be to big. I also wanted it to be a complete thing, and not in parts. I want to be able to put it on without lots of needles or an under cap. 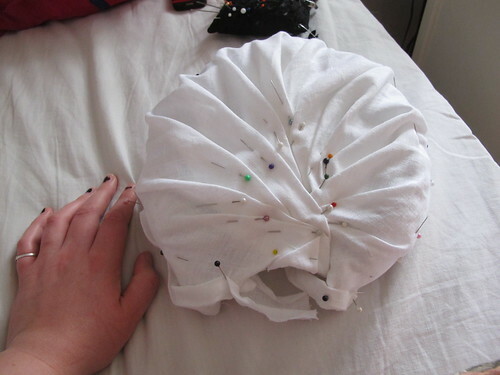 My roll was also cut on the bias, to make the curving nicer, and then it is stuffed with wool. 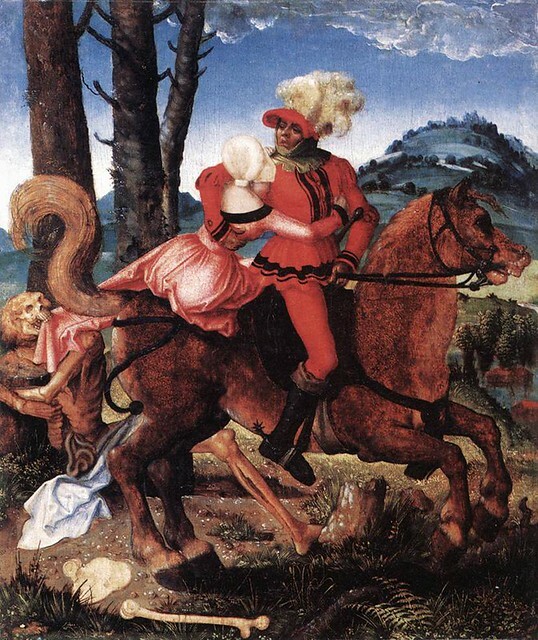 I draped it in pleats it in the back like in this painting by Hans Baldung Grien from 1505 It will also have the square detail in the back as in the pictures, to cover up the edges of the pleated fabric. Now it just needs some hand sewing to keep the folds and everything else in place, Ill put up some pictures of the finished thing soon. 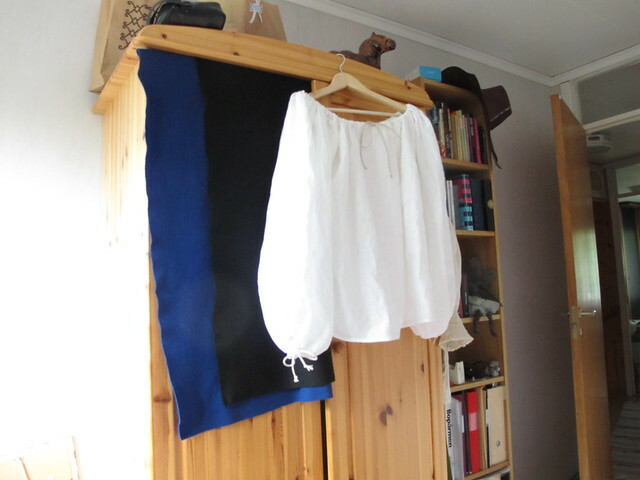 This year is the first year in my life to go to Medeltidsveckan (medieval week) on Gotland and since I have NO medieval clothing what so ever this spring have been very much about making a few outfits for me to wear. 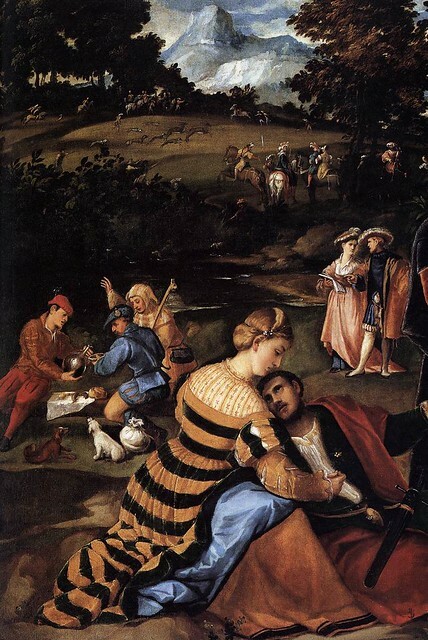 My favourite fashion turned out to be the 16th century German fashion. It just fits me so well and I just love it and I am well in the way of making my first dress. 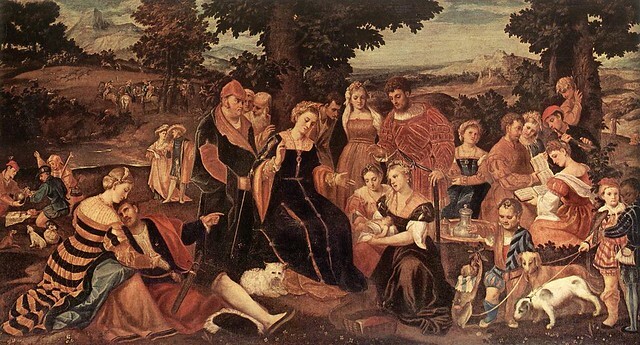 But I just had to convince Bella (the girl in the pictures of my last post) who is also going to medeltidsveckan for her first time that she totally needed to be a 16th century German woman to. That was SO easy especially as I offered to actually sew her outfit for her and that it could be black, striped and not that colourful. She does not wear colour that much and sticks to the black outfits with mixed in grey tones. So what I made for her is a three part outfit; skirt, blouse and a bodice. All machine sewn, historical accuracy was not the important thing but a pretty dress that when worn looked correct. It is made in a nice white linen fabric from Medeltidsmode, they have the best collection of wool and linen fabrics I have found in Sweden so far, and the woman who runs it is so nice and really cares about her customers. The neck and sleeves gathers with a cord, so super simple but still nice. 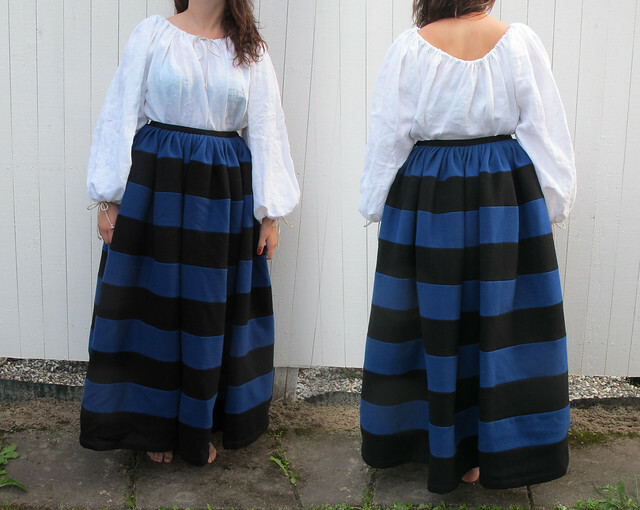 The skirt is made out of wool, also from Medeltidsmode.se, it is just strips that have been sewn together to form the skirt and then pleated onto a waistband, the skirt is lined with the same linen fabric as in the blouse. I know that it should feature a under skirt in stead of a lining, but Bella wanted a low maintenance outfit, so I decided on less thing to put on is a good thing, so therefore a lined skirt. 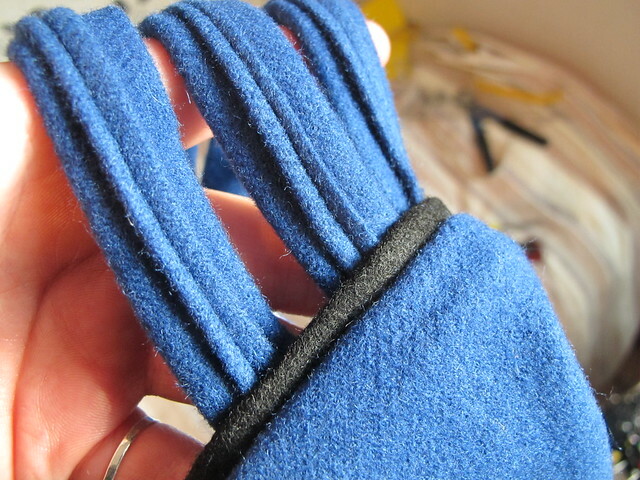 The waistband is really thick due to the many layers of wool. 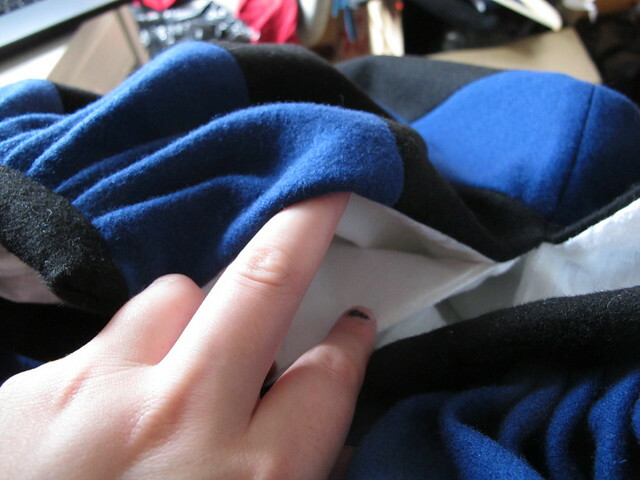 Another thing that is not accurate with this skirt is that it features a hidden pocket in the opening of the skirt, Bella wanted a safe pocket to put her phone and money in. I bribed my little sister to model Bellas skirt and blouse for me “if you do this you can borrow my red nail polish”. 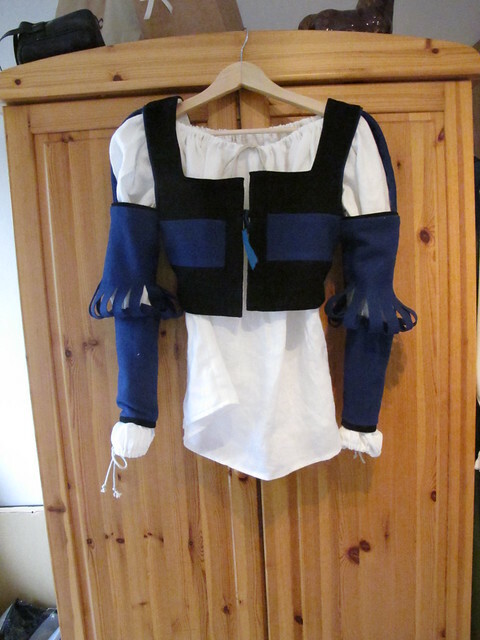 The bodice was to small for my little sister so you just get to see it flat on my bed in stead.It is made out of wool and lined in linen. 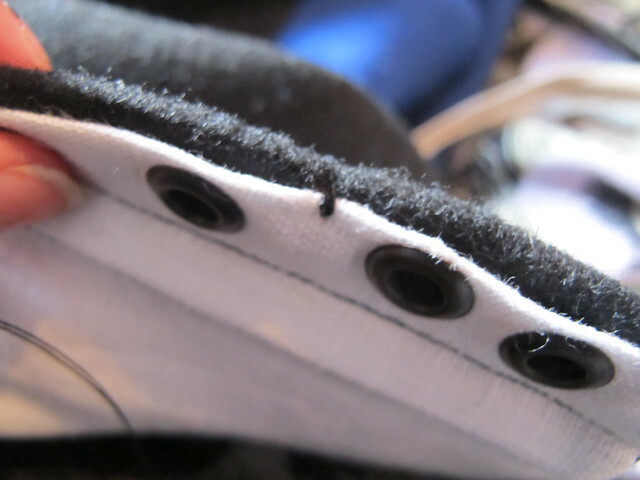 It has a hidden lacing in the front, spiral lacing of course and reinforced with two strips of flat steel boning. 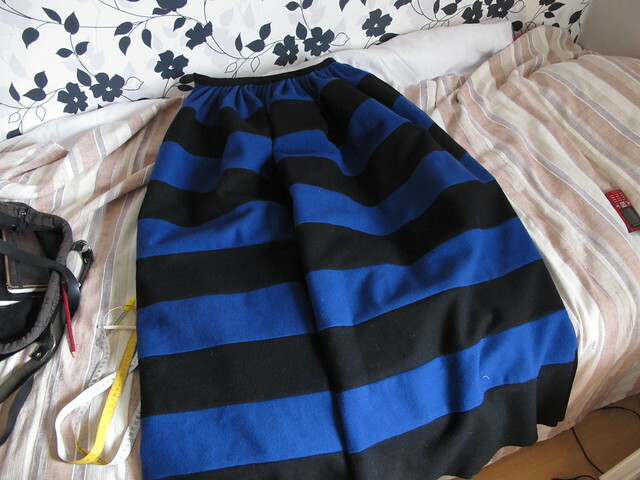 Ignore the wonky seam on the side of the boning, I stitched in the ditch in the front and that is how it ended up. 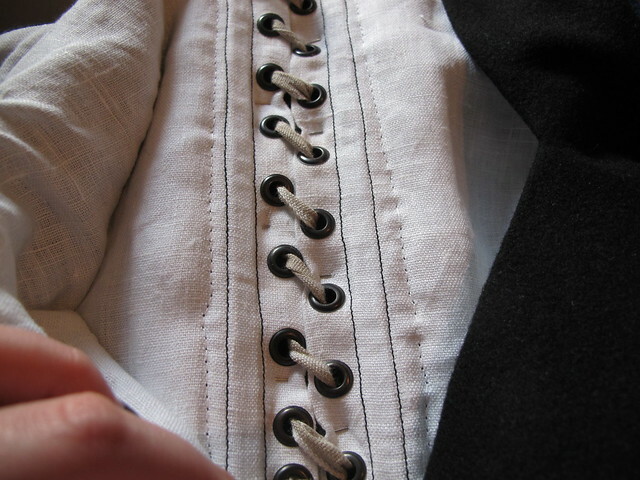 To not make it gap when worn, is is fastened with small stitches here and there in between the lacing. It have been slashed at the elbow. 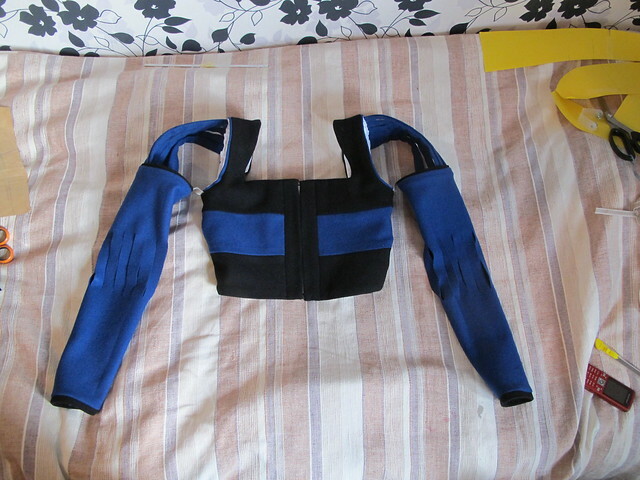 And this is how it might look when worn, the front looks uneven but is is not, I was lazy and only tied the bodice together with a string in two of the holes and because it is spiral lacing it goes uneven when just tied in two holes. Better pictures will probably be taken in week 32 at Gotland so you will see the finished outfit on Bella after that. In school we had a project where we should find an architect/building to take our inspiration from. I have had a picture of Casa Batlló by Antoni Gaudí in my inspiration folder for ages so I choose to go with Gaudí as my inspiration. And then down the road in the research process I found Mucha, how could I have missed Alphonse Mucha for all these years. I wanted to use the bone like pillars that hold up Gaudís buildings and the draped fabric and flowing hair of Mucha to make a dress. 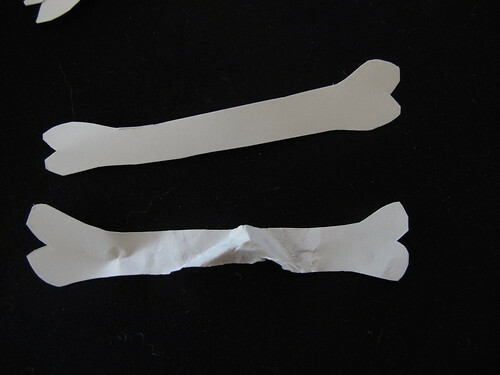 paper bones to play around with the bone design. several toilles was made to make sure that it fitted my friend Isabell that had promised me to model it for me. It is interesting that a small bust is in need of so much work with the toille, and that that work is in such a different way from a large bust which is what I normally work with. 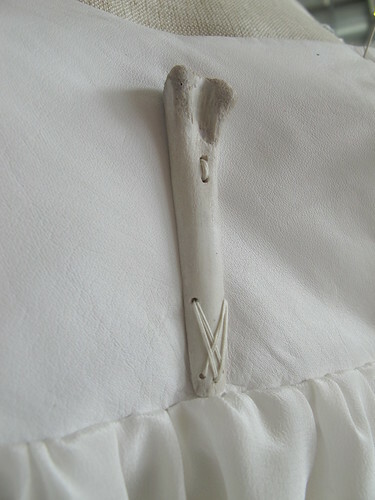 The bones that I used is chicken bones that is leftovers from a bunch of nice meals. They have been cooked and cleaned and here they are drying, later I painted them and lacquered them. 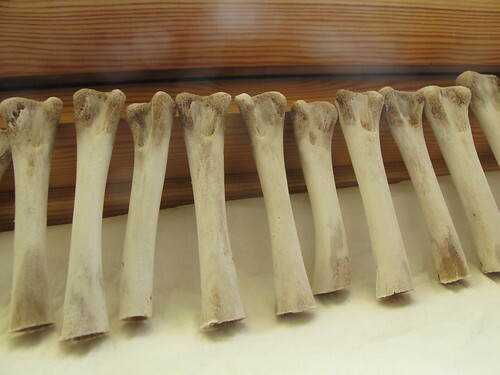 I could have bleached them as you normally do, but chicken bones are so brittle so I did not want them to be more fragile then what they already was. 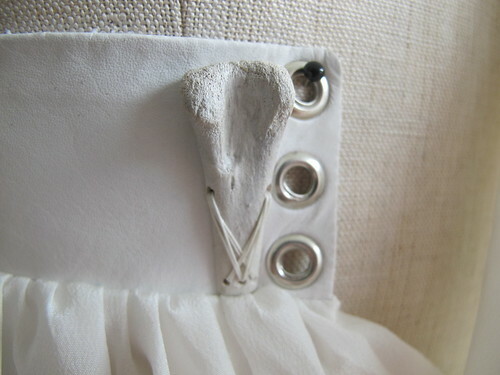 To be able to sew them onto the dress they have been filed down to be flat on the backs and thinner and the small holes was drilled to enable the sewing. The top of the dress is made out of white leather that is prepared with a new kind of tanning process called “wet white”. It is a organic tanning process which is much better for the environment than ordinary chrome tanning. Where chromed tanned leather can make it’s wearer allergic and is highly environment damaging, wet white leather can be recycled and it can also used as fertiliser if prepared right. Another plus is that it comes in white naturally, chrome tanned leathers are grey, vegetable tanned leathers are a really light brown at best. To achieve white the leather these must be finished heavily which makes it loose a lot of leather character and almost always turns out looking like plastic. Another plus is that it is not as sensitive as vegetable tanned leather, I was able to press the seams with with a hot iron, something that a vegetable tanned leather really do not appreciate. The leather is amazingly soft and drapes just like fabric, it is truly amazing. One downside is that people do not think it is leather at all due to it looking so soft and white without a coating. I have lined the top part of the dress with cotton coutil, to make sure that it holds the breast in place and do not stretch the leather and making it to big. The bottom part is a really light and see-through silk fabric and the skirt has about 8 meters of fabric in it, I wanted it to be light and flowing. All the pictures are taken by me in an abandoned house that is just around the corner from where I live, click them so see them in a larger format.